The selection of the presented personalities and work is amazing. 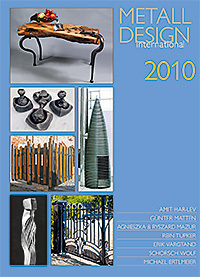 The text (in German and English) introduces the seven chapters and presents eight outstanding blacksmiths, including a young, promising metal artist. Michael Ertlmeier is from the Upper Bavarian. A full chapter in the new yearbook gives, for the first time a comprehensive idea of the work by this young smith. Amit Har-lev, a smith from Israel, was accepted for the first time to this book series. From the circle of the many pupils of the world-well-known taught by blacksmith Uri Hofi at his forging school in Sharona,Israel. For the first time their work is presented to the international public. The extensive chapters in the 2010 yearbook will leave many colleagues with their tongues hanging!